Stowing the inner stay appears to be quite the challenge sometimes. All too many times I have seen systems that are either over complicated, under engineered or are just plain ineffective. Below I describe a method that is very straight forward, simple and effective. Almost in every case imaginable, the inner stay storage bridle, is the key piece to any effective inner stay storage system. However, these days it seems harder and harder to find these clever little bent pieces of tubing. Wichard, was one of the original makers of these bridles and they called it a Stowage Clip. Also, C.Sherman Johnson, who used to make a beautiful one of these (similar to the design of Wichard’s), has for some reason redesigned it to what I think, is not as good of a design (see pic below). We here at The Rigging Company will simply make our own as they are needed. For reference, the one pictured above is the only image I could find that is similar to the one we make. This is what they are supposed to look like. Next you will need two attachment points at (or slightly aft) and forward of the mast, preferably, just off to one side. If you don’t already have something in place, i.e. a stanchion base, mast pulpit, Dorade box, sturdy handrail, or maybe even one of the shroud chainplates or turnbuckles, I would recommend some folding pad eyes, mounted on the deck. The folding pad eye is nice as it folds flat when not in use. The forward pad eye is for the stowage bridle attachment, which will require either a short strop or a small block and tackle between the welded eye on the bridle and the pad eye. 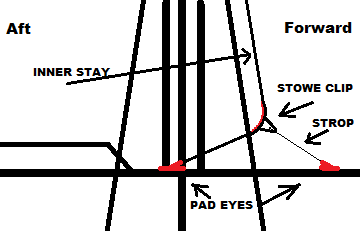 This should keep the stay just forward and off of the mast and spreaders (see diagram). The aft pad eye is to attach the terminal of the stay by way of either a quick release lever, block and tackle, or direct attachment. I personally prefer the block and tackle because I like to take these big, heavy and expensive inner stay levers down below and out of the way. (Read more here for a quick note on choosing and setting-up your quick release levers.) Using the tackle between the bridle and forward pad eye instead of a strop (as pictured above) is our preferred method. This will require the stays end terminal to be simply shackled, lashed or otherwise directly attached to the aft pad eye. The stay is then tensioned using the stowage clip and tackle. This set up is simple, tried and trued. The placement of the two attachment points at deck level (i.e. pad eye’s, turnbuckle, stanchion base etc.) is the key to the functionality of the system. The goal is to allow the stay to be stowed aft, with adequate tension so that it is out of the way and tight, yet forward enough to keep it off of the mast and the spreaders. Keep this in mind when setting up your inner stay storage system. ~I hope you find these blogs useful and helpful. We are always looking for new ideas on what to write about. So if you have an idea that you would like us to write about or even would like to guest blog on our site to plug yourself, your business or your boat, feel free to shoot us an email or leave us a comment (below) and we will get back to you. Very informative and helpful, thank you! I’m presuming that the forestay and removable inner stay should be parallel to each other, do you rely entirely on the mainsail luff tension or do you make adjustments to the backstay tension as well to compensate for the additional forward load?? Thanks. They do not need to be parallel, sometimes they can be, but not all the time. 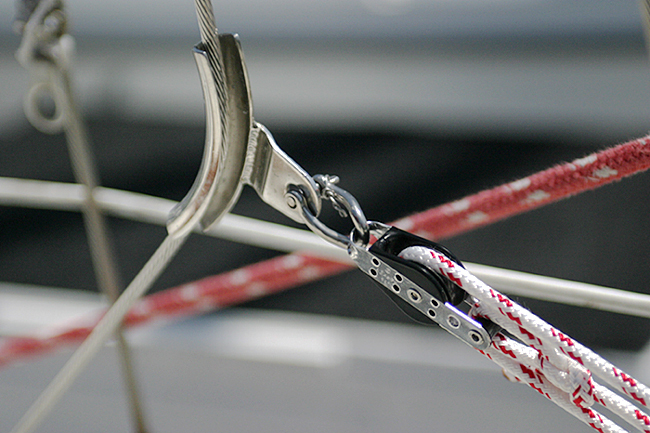 It depends on where you end up being able to put the connecting hardware; deck attachment relative to the place that you chose on the mast. Read more here https://theriggingco.com/2017/04/10/the-solent-has-its-own-stay/, we get into the load discussion at the bottom. This is a Beneteau 51. Trying to keep the original design, we installed a new a hydraulic cylinder on the bottom of the babystay attached to the foredeck (upper section of cylinder is attached to the baby stay wire by a quick release shackle). It has 2 problems: 1, genoa sheets (big 152% genoa) get stuck on the bottom section of the babystay (between shackle and hyd rod) when tacking. And 2, really hard to undo and properly stow the system without hitting the deck or mast, all this for the spinnaker setup. Any ideas to fix 1 and 2. We got your email. THANKS! We'll have a reply crafted to you shortly. I apologize for the late reply. Yes, there are better solutions. First, my preference, use a T terminal and backing plate with rubber retaining plug. We can supply this if you like. The install is very straight forward minimally invasive, and very strong. The other option is to install a fitting as you suggest but it’s already pre-made. The issue with this is, it is more to install, not as strong and can lead to excessive dissimilar metal corrosion. Give us a call for more tips and tricks. Hope that helps and thanks for the question! Islander 36 solent stay. Which is best approach for mounting fwd? glassed it to fwd chain locker. what’s up? I sail San Francisco. Can you shoot me a picture of the bow from on decks. Then also one of what is down below. Also a zoomed out picture of the whole boat, to the mast head, would be great. Just so I can wrap my head around it better and give you real advice. Email jimmie@theriggingco.com. Looking at the curved inner stay storage bridle I’m wondering if the inside diameter of the tubing is large enough for removal/replacement over the swaged fittings at the end of the stay? These fittings look fairly bulky. Certainly you wouldn’t want a curved element left on the tensioned stay. Appreciate your articles and information. …..the curved piece of tubing is actually cut in half. 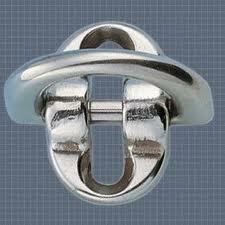 It is to be used as a fairlead only for the storage of the stay. It is to be removed and stowed elsewhere when the stay is in use. Let us in now if that helps! It is not captive on the stay and will handle up to 1/2″ wire without trouble. Looks like a great system! 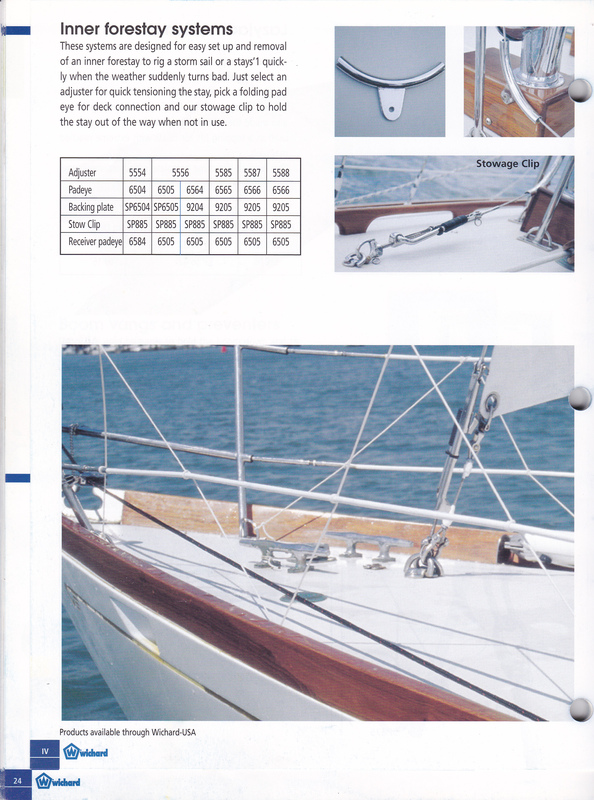 We are looking at an aprox 38′ yacht, and most of the models we have seen do not have an inner fore-stay in the rigging. We are planning on sailing around the world. Do you think on a yacht of that size that an inner forestay is worth while? Thanks Viki. And thanks for liking many of my various posts. I have been reading and enjoying your stuff as well. What kind of boat is it? I think it may be a very resonable/ viable option for your hoat, but I can answer you better with more details. Feel free to open up an email dialog with me and send some pictures. Click on the contact us tab for info. I’d be glad to discuss further. Also you may want to look at a Post called The Solent Stay…..or something like that. Just use the search bar. We are looking at a Jeanneau Sun Odyssey 379 – one of the new ones. Not purchased as yet, but just doing research at the moment, and there doesn’t seem to be too many new boats in that size range with inner forestays fitted as standard or an option? What would you suggest would be the benefits or drawbacks of having one? Is it something that can be easily installed on a factory standard mast? The newer/ modern sloop designs are all fractional, mast forward designs, with non-overlapping foresails, and large mainsails. There are other boat designs (like the cutter) that are still made today that utilize an inner stay as standard equipment. See this link http://www.yachtworld.com/boats/2014/Challenge-40ft-Cutter-2261919/Port-Nelson/New-Zealand#.U8WGPfldUlc. If the new boat is equipped with this a non-overlapping foresail concept, I may just skip the inner stay idea. Maybe just equip the boat with storm sail with a zipper luff. Or just douse this small headsail and have a storm sail with a bolt rope that can be hoisted into the furler’s sail groove. If this boat does have a overlapping genoa, great for light air areas, it may still be advisable to have an inner(storm) stay installed. The mast attachment is fairly straight forward if the mast down. The deck attachment can usually be bit more tricky and will vary from boat to boat. Making sure that it is tied into the boat’s keel properly is the key there. So it can be done, but may require some professional forethought to make sure it is right. As the article states stowing this system, that will hardly get used, is of utmost importance. Lastly maybe choosing a synthetic stay material may be a good thought for ease of use, removal, and storage. Either way I may look to the Solent Stay idea VS. a Stay Sail Stay to avoid the use of runners. Use the search bar at the top right to look up Solent Stays for more info. Hope this helps and thanks for commenting Vicki.